Woodfarm House01485 528586work Bed & BreakfastWith a 5 star Gold award for hospitality, plus Winner of the Regional Enjoy England award for excellence and Best Guest accommodation - There is much more at Woodfarm House. The property is reached by passing between the 2 small lakes with ducks and moorhens. 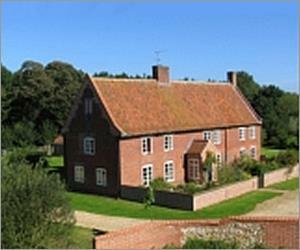 Located in a beautiful tranquil spot which is home to deer, squirrels, pheasants, swans and many other birds, your host, Peter, welcomes you along with Flintoff a Korat cat into his beautiful Norfolk country house as his personal guest. Woodfarm House offers a calm luxurious atmosphere with garden fresh flowers in the rooms and a log fire burning in winter. Great attention to detail has been paid to create the perfect ambience and the feeling that you are a cherished family guest staying in a country house. Spacious rooms are decorated in warm neutral colours to enhance the period characters of each individually designed room. Sumptuous beds, comfortable armchairs natural flooring, the finest linen fluffy white bath towels and comforting bathrobes are some of the touches that ensure a memorable stay. Each room has excellent views overlooking woodlands, countryside and lakes. Breakfast is served in the oak-beamed dining room with woodland views or on the morning terrace (weather permitting) on a table with fine white linen, silver cutlery and white china. There is a choice of cereals, yoghurts, cheeses, smoked salmon, fresh berries and exotic fruits. This is complemented with freshly ground coffee, a choice of teas and freshly squeezed orange or grapefruit juice. Local free range eggs are cooked to order served with grilled sausages, bacon, cherry tomatoes and fried mushrooms. Afternoon tea can be enjoyed on the sunny west terrace or you can sip your favourite drink on the sun deck whilst watching the sun set in the big Norfolk skies. With a 5 star Gold award for hospitality, plus Winner of the Regional Enjoy England award for excellence and Best Guest accommodation - There is much more at Woodfarm House. The property is reached by passing between the 2 small lakes with ducks and moorhens. Located in a beautiful tranquil spot which is home to deer, squirrels, pheasants, swans and many other birds, your host, Peter, welcomes you along with Flintoff a Korat cat into his beautiful Norfolk country house as his personal guest. Woodfarm House offers a calm luxurious atmosphere with garden fresh flowers in the rooms and a log fire burning in winter. Great attention to detail has been paid to create the perfect ambience and the feeling that you are a cherished family guest staying in a country house. Spacious rooms are decorated in warm neutral colours to enhance the period characters of each individually designed room. Sumptuous beds, comfortable armchairs natural flooring, the finest linen fluffy white bath towels and comforting bathrobes are some of the touches that ensure a memorable stay. Each room has excellent views overlooking woodlands, countryside and lakes. Woodfarm House also offers delicious home cooked evening meals. The style is English country cooking. The menu is discussed in advance and typical dishes include roasts, casseroles, game supplied by local estates and freshly caught fish. Favourite puddings include summer, rice, bread and butter puddings, and Eton mess and tarte tatin. On warm summer evenings, dinner may also be served on the West-facing terrace. The cost of a two course dinner is £27.50, which includes a complimentary mineral water. There is also a wide range of nearby restaurants. Awarded Best B&B - The Guardian. 100 Best Places to Stay - Sunday Times. Children welcome from age 8. Please see website www.woodfarm-house.com for full details. London: M11 to A11 at junction 9. A11/A14/A11 (sign to Norwich) to roundabout then A1065 towards Swaffham. Pass through Swaffham towards Fakenham for 8 miles. After Fox and Hounds on left take first left signed to Helhoughton. Continue till T-junction (2.5 miles) then towards Fakenham for 0.2 mile then left on sign to East Rudham. After 0.2 miles take first turn on right to Woodfarm House. King's Lynn: A149 then A148 towards Cromer. The nearest rail station is King's Lynn which has frequent services from King's Cross London, via Cambridge, with a journey time of less that 1 hour 45 minutes. Timetables can be obtained from http://www.wagn.co.uk. A taxi service can be arranged with a journey time of about 25 minutes.